#1 in the Wordcraft Speculative Writers Series. 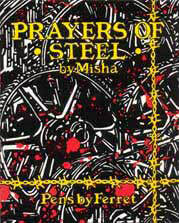 As far as I know Misha wrote the first cyberpunk poetry. I was impressed by both the quality of the language and the vividness of the metaphors...I do like the incantatory effect and the restlessness of the rhythms.